Bolamba performing arts dance group on stage. 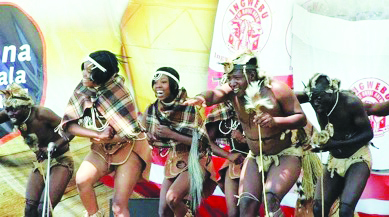 GWANDA - Bolamba Performing Arts based in Mat South clinched gold medal in the Ingwebu Cultural Dance festivals national finals held in Bulawayo White City Stadium last month. Best cultural dance groups from the southern region flooded White City for the ultimate prize of $1 000. Bolamba Performing Arts which specializes on dances like Setapa and Phathisi from Botswana emerged champions. The group was second best in the provincial competitions held at Gwanda Manza’mnyama Sports Bar in Old Jaunda Township in July. “We really worked hard towards these finals. We came second at the provincial finals so we went back to the drawing board and drafted a winning strategy. We won a lot of money and a lot of projects are in the pipeline. We want to shoot a DVD and release a new album before the end of the year,” said Mthabisi Dube. Simunye Arts from Mat North came second and walked away with $750 and Mbada Arts Ensemble from Midlands emerged third winner and collected $500. There were 10 groups in the competitions; three from Mat South, three from Mat North, two from Midlands and another two from Bulawayo. The group is inspired by their motto which reads “love what you do and do what you love” from their Botswana based choreographer KenanaoTsholofelo (Dr Nxaskar).